Learn how to use SVG files to create beautiful projects. Have you hopped onto the SVG bandwagon yet? I’m in love with SVG files but for the longest time I had no idea how to use them. Are you in the same boat? 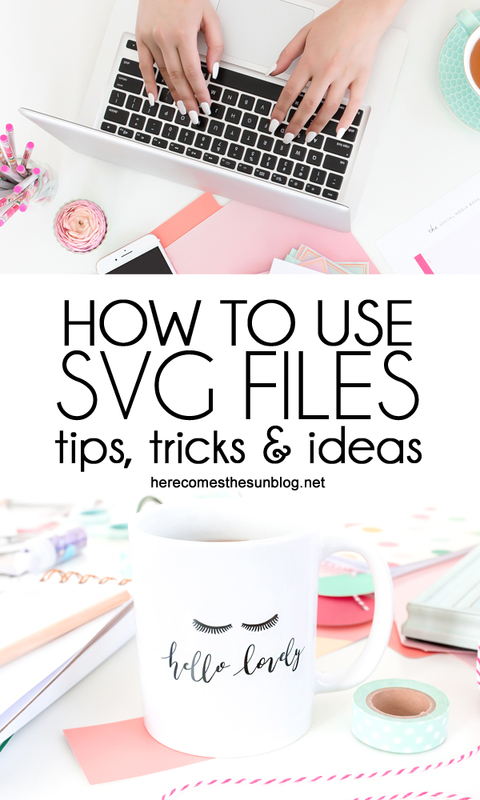 If so, you’re in luck because today I’m going to show you how to use SVG files. Get ready because you can do amazing things with them. SVG stands for scalable vector graphic. The more common name for an SVG file is a cut file. 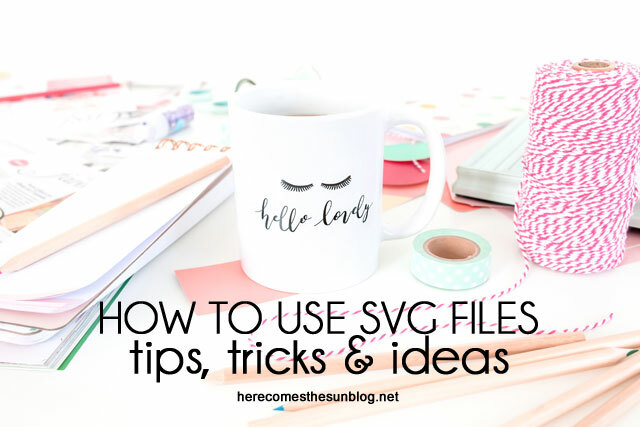 An SVG file is a file format that can be cut out using a personal cutting machine such as a Silhouette or a Cricut. Both are fantastic machines. I own a Silhouette so I don’t know the ins and outs of the Cricut but Cori at Hey Let’s Make Stuff and Stephanie at Crafting in the Rain have numerous Cricut tutorials on their sites. Melissa at Silhouette School is my go-to person for Silhouette tutorials. HOW CAN I USE SVG FILES? SVG files can be used to make many different projects. Here are three of my favorite ways to use SVG files. Creating iron-on designs using SVG files is one of my favorite ways to use cut files. Think holidays, family vacation shirts or baby shower gifts like onesies. The possibilities are endless. To use SVG files as iron-on designs, you will need to cut your design out of heat transfer vinyl and then adhere the vinyl to the clothing per the directions on the vinyl. You can use an iron or a Cricut Easy Press to adhere the vinyl to the clothing. The most common item to use in conjunction with iron-on designs is clothing but you can also adhere heat transfer vinyl to tote bags, fabric banners, or just about anything made of fabric. I used an SVG file to make a workout tank when I was training for the NYC Marathon. If you know me, then you know I am a big fan of hand lettering. I love to letter ALL.THE.THINGS. My newest favorite hobby is converting my hand lettering to SVG files so I can place it anywhere! I usually cut my lettering out of vinyl and place it on items such as mugs, tumblers, clipboards and wooden signs. I recently created some hoop art using my hand lettering and vinyl. If you are placing your vinyl on something that is going to get wet (dishes, mugs etc. ), you’ll want to be sure to use a permanent waterproof vinyl and make sure hand wash your item. I’ve put too many cups through the dishwasher only to have the vinyl come right off. WOMP WOMP. You can also use SVG files to create designs out of cardstock. 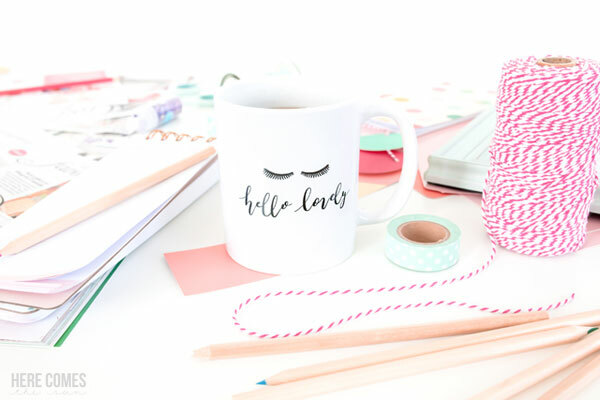 Cut the SVG files out of cardstock and you can make so many fun projects like gift cards. cupcake toppers, confetti and even photo booth props. The sky is the limit on designs made from cardstock. Now that you know how to use SVG files, what types of projects will you make? You can find all my SVG files here.